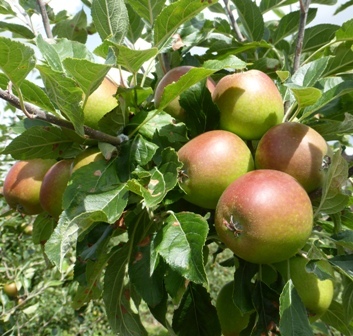 It is the time of the year for orchard competitions....East Kent Fruit Society held their competition on 18th & 19th July. The Goudhurst and Paddock Wood NU Branch held theirs on 27th, 28th & 29th July. 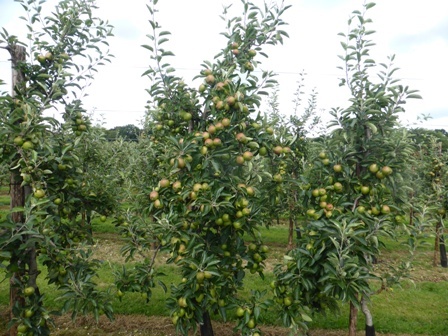 EKFS Stone fruit judging took place on 28th June. 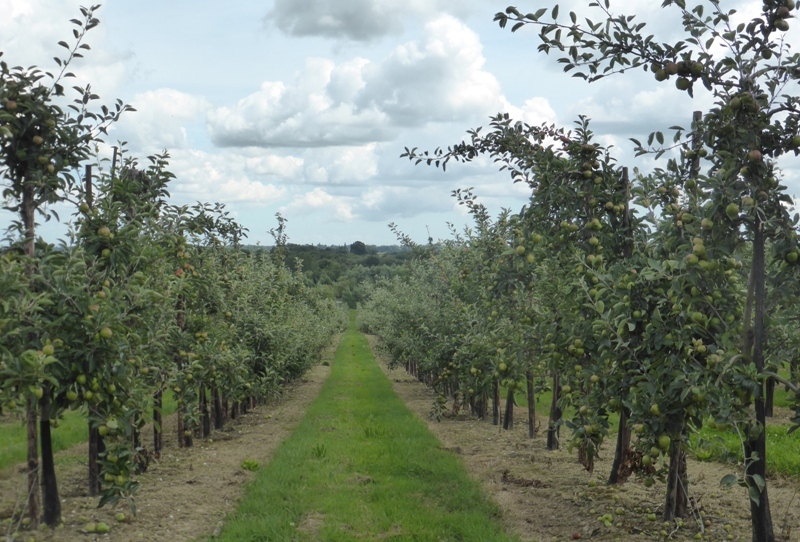 Although The English Apple Man did not act as a Judge this year at the Goudhurst & Paddock Wood NFU Orchard Competition, he was 'present & privy' to the judges thoughts in the post competition meeting when results are collated. 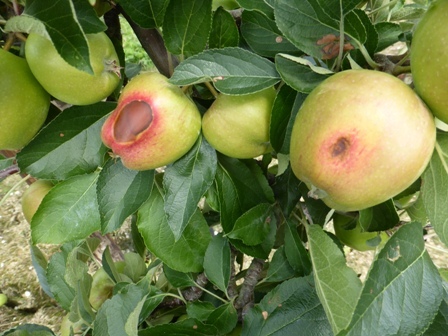 The clear picture coming from the judges, is that this season has been very challenging, with the wet and at times humid conditions, scab & mildew has had a very favourable environment to spread. A number of pests have also reared their 'ugly heads' with woolly aphids much more prevalent than usual. 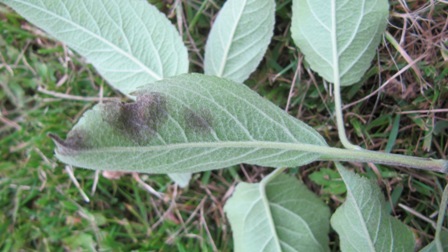 The judges also found a lot of 'sunscorch' - always a risk if a sudden very hot sunny spell arises as it did on 19th/20th July when temperatures rose above 30 C.
Woolly aphid also known as American blight; its Latin name is Eriosoma lanigerum. 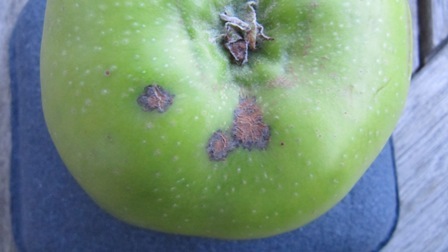 It affects apples (eating and crab) pyracantha and Cotoneaster horizontalis. The cause; a sap-sucking aphid (insect) active from April to October. On small trees with light infestations, it is possible to control woolly aphid by scrubbing the aphid colonies with a stiff-bristled brush. This should be done in spring-early summer before an extensive infestation has built up. Woolly aphid has a number of natural enemies which help to keep it in check, although they are rarely effective enough to prevent damage occurring. They are eaten by some ladybirds, lacewings and hoverfly larvae, and they are also attacked by a parasitic wasp called Aphelinus mali. The parasitic wasp can sometimes be found in gardens, particularly those where little spraying is done. 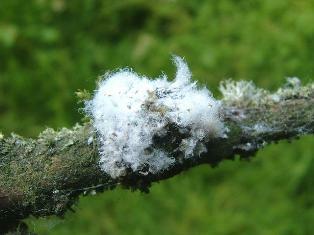 Woolly aphid overwinters on its host plants as immature nymphs that hide in cracks in the bark or in crevices around old feeding areas. 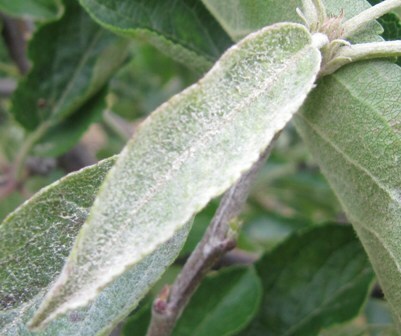 During the winter months the aphids do not produce the waxy material that gives them the characteristic woolly coating in summer. 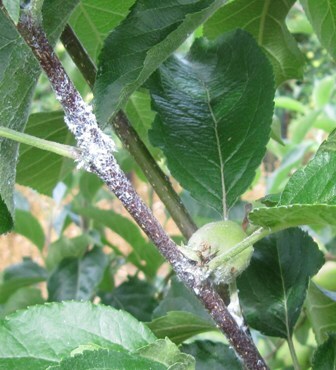 In spring, the aphids become active again, mainly around old pruning cuts or other places on the trunk or larger branches where the bark is thinner. They begin sucking sap from beneath the bark, and start secreting the fluffy 'wool'. 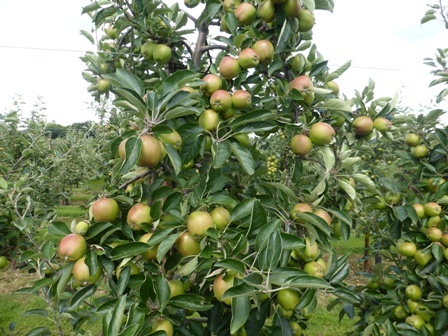 "Earwigs are often abundant in orchards. This research will increase our understanding of the biocontrol potential of this predator. The study will assess the extent to which earwigs consume pest species such as aphids. It will enable us to determine if the diet changes over the season and whether any changes are preferences of the predator or simply the result of availability of prey species. The information obtained will enable us to assess the potential usefulness of earwigs in helping to suppress pests". Where natural predators fail to keep woolly aphids under control, commercial apple growers use a 'double pronged' attack on Woolly Aphids when the pest builds up (as in this summer) - by spraying with a Magnesium Sulphate spray and following up a day later with Gazelle; the Mag Sulphate spray removes sufficient of the Woolly cover allowing the Gazelle (insecticide) to get at the Woolly aphids. 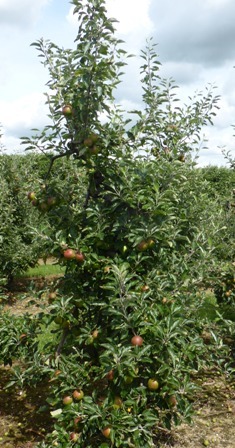 This season, as in all seasons, control of Scab & Mildew is a prerequisite for good tree management and quality fruit. Once scab gets out of control a crop can easily become of low value. 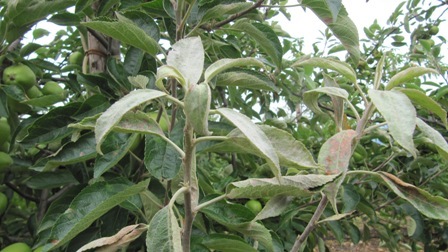 Mildew infection can badly affect the tree health, spoiling important new growth. 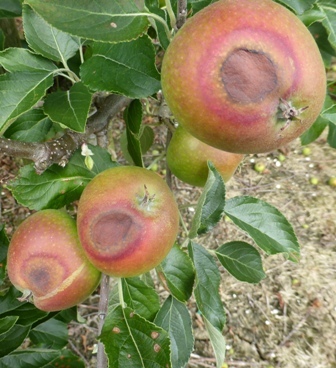 2016 has been difficult for both and growers have had to be vigilant; maintaining fungicide sprays from the first signs of 'bud break' is essential for controlling scab. Mildew overwinters on shoots infected the previous season and again a fungicide spray is required at regular intervals from the first signs of new season extension growth. 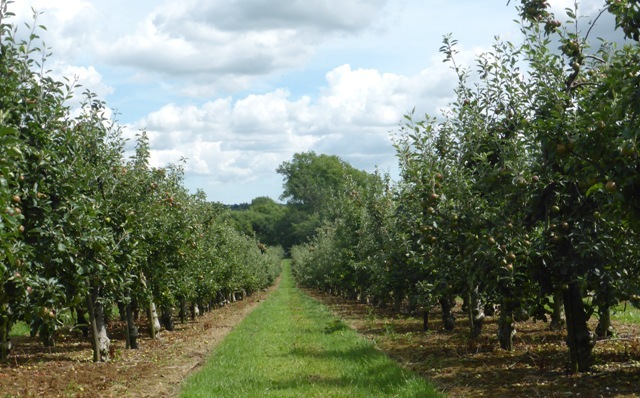 The general consensus from the judges at the Goudhurst & Paddock Wood NFU branches 2016 orchard competition was this is a season where there are no 'Gold Standard' entries; however the crops are generally commercially good, but not at the level we have seen in less challenging seasons. Next Wednesday - 10th August, the annual presentation of prizes will be awarded after a farm walk at the Winning 'Overall' Farm - George Chambers Northiam farm at Horsmonden in West Kent. The evening starts at 6.30pm. Sun scorch was identified as significant by the Judges at the Goudhurst & Paddock Wood Orchard Competition and this was not difficult to find this afternoon in both Cox & Braeburn orchards; significantly more prevalent on exposed fruit on the side of the tree catching the afternoon sun when it was at its hottest! 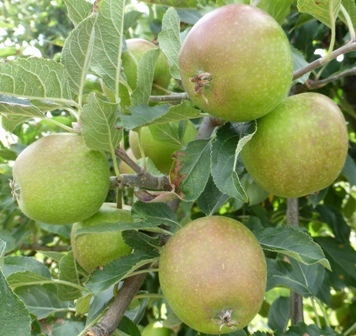 That is all for this week....next week The English Apple Man will report on the Farm Walk and Presentation of Prizes.